Climate change, driven by increases of carbon in the atmosphere, poses a long-term threat to large coastal cities that are economic and population centers. For this hackathon, we are illustrating the risks locally to New York City. We are showing how rises in sea level, driven in part by melting polar ice, will start reclaiming parts of Manhattan and Brooklyn. 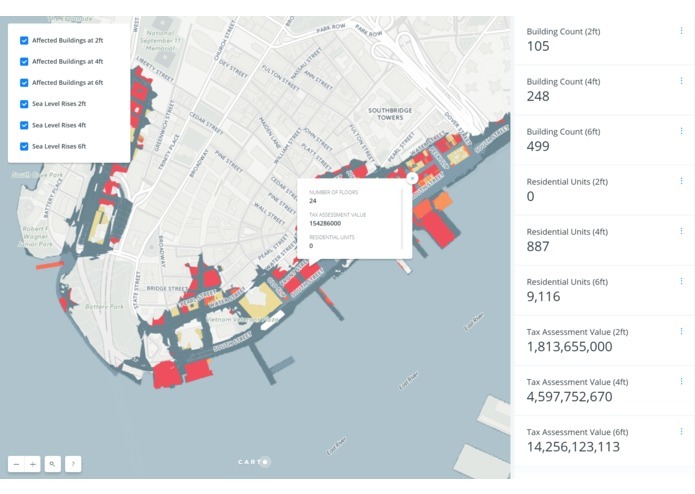 If measures are not taken to prevent ocean rise or fortify New York City, our project will show what potential losses will look like in terms of property value costs and the number of people displaced. To build this project, we used buildings data and tax assessment data from the City of New York. We intersected it with ocean rise models generated by the NOAA Office for Coastal Management. Designed and visualized map data using Carto.